This quad band power Amplifier Module is designed to support dual, tri and quad band applications. The module includes an integrated power control scheme that facilitates fast and easy production calibration and reduces the number of external components required to complete a power control function. By Anadigics, Inc. This is one package pinout of AWT6108R,If you need more pinouts please download AWT6108R's pdf datasheet. AWT6108R circuits will be updated soon..., now you can download the pdf datasheet to check the circuits! 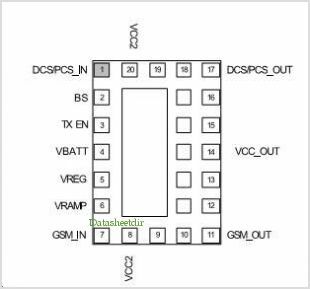 RM009, Power Amplifier Module For Dual-band Gsm900 Dcs1800 Solutions Inc.